Tuohy Law Offices is pleased to announce that founder Tom Tuohy has been recognized as a 2015 member of the “Nation’s Top One Percent” by the National Association of Distinguished Counsel. 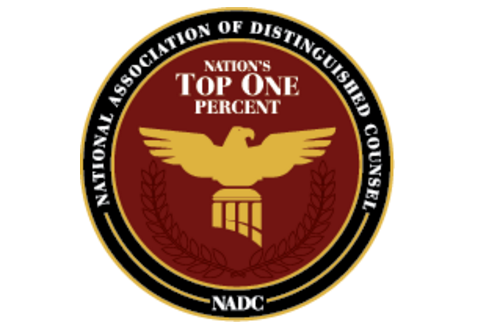 NADC is a national organization dedicated to promoting the “highest standards of legal excellence.” Its mission is to objectively recognize the attorneys who strive both to elevate the standards of the Bar and to provide a benchmark for other lawyers to emulate. “I consider Tom Tuohy to be one of Illinois’ outstanding attorneys and someone that can be relied on and trusted,” said Jesse White, Illinois Secretary of State and founder of the world renowned Jesse White Tumblers and Scholars. NADC members are vetted by a research team, selected by a panel of attorneys from independent neutral organizations, and approved by a judicial review board as exhibiting virtue in the practice of law. Only one percent of attorneys in the United States are awarded membership in NADC. This class of advocates consists of many legal profession leaders from across the nation. The mission of the NADC is to objectively recognize the attorneys who elevate the standards of the Bar and provide a benchmark for other lawyers to emulate. By virtue of the incredible selectivity of our research process, only the elite few are invited to join the ranks. The recipients of this prestigious award have demonstrated the highest ideals of the legal profession. Tom Tuohy, a Chicago Living Trust and Personal Injury Lawyer, Chicago, Il, and founder of Dreams for Kids, is recognized as a 2015 member of the “Nation’s Top One Percent” by the National Association of Distinguished Counsel for his commitment to working class and undeserved Americans and the urban communities in which they live. Chicago attorney Tom Tuohy has practiced law for 33 years, establishing Tuohy Law Offices on a foundation of service. Mr. Tuohy Comprehensive Benefits of America, LLC (CBA) in 2015 and serves as CEO. CBA elevates the middle class by providing access to high level professional representation at reduced rates in insurance, financial planning, legal and real estate services. Mr. Tuohy founded the non-profit organization Dreams For Kids in 1989, creating social change through service learning in an award winning leadership and social entrepreneurship curriculum for at-risk youth. Mr Tuohy was sworn in and admitted to the United States Supreme Court Bar in 1990. Founded in 19828 by Tom Tuohy, Tuohy Law Offices has been serving working class and under-served Americans and their communities for more than 33 years. The attorneys affiliated with Tuohy Law Offices are the top Chicago personal injury lawyers and have recovered over $600 million for its clients who have suffered personal injury, including many record verdicts and settlements. Mr. Tuohy has established over 2,700 Living Trust estate plans for families. Today, Tuohy Law Offices is recognized as one of labors most respected law firms, serving the legal needs of thousands of clients and providing representation and educational seminars for municipal employees and union members. Chicago area law firm and injury lawyers in Chicago-Tom Tuohy Personal Injury Lawyer Chicago Il.